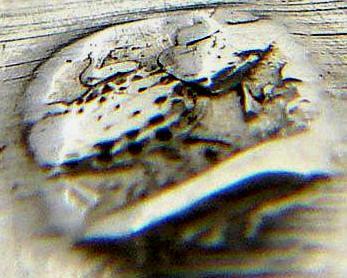 In order to prevent and detect fraud of hallmarked silver articles, French authorities instituted, by Ordinance of 1st July 1818, a system of countermarks on the opposite side of the guarantee mark. 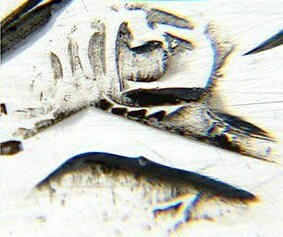 These countermarks are known as "bigornes". The term bigorne literally means two-horned anvil or two-beaked anvil and refers to the shape of the projecting ends of the anvil. Each anvil has two striking areas, one flat and one of rounded shape. The rounded horn served to mark hollowware and the flat horn was used to mark flatware. The projecting ends of the small anvil were intricately engraved with varied and finely drawn representations of insects. The silver article was placed on the beak/horn of the steel anvil and when the guarantee mark was struck, the force of the strike created a counter-impression of insects on the underside of the article against the anvil. There are three sizes of bigorne marks, having randomly arranged insects on a plain background, except for the small bigorne which had both a rounded and a flat end. 1. The large bigorne with a horn on which the six different insects are engraved inside various frames (triangle, pentagon, indented parallelogram, lozenge, etc). 2. The medium-sized bigorne with a horn bearing engraved insects, but not so many as on the large bigorne. Both bigornes are the same for Paris as for the Provinces. 3. The small bigorne with two horns, one flat and the other rounded, bearing engraved triangles and lozenges with linear designs and letters. This system is even more sophisticated than the preceding one, because the insects are engraved aligned in relief and separated by parallel zigzag moulded borders. This series was further distinguished by having one set for Paris and another set for the Provinces. 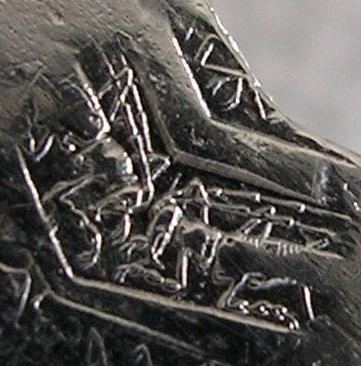 The surface of the anvil is covered with varied and finely drawn engravings of various insects which mark the underside of the silver article when it is struck on the upper side with the guarantee mark. The assayer placed the item on the horn of the anvil, then placed the Minerva (or other) punch on the item, and struck the Minerva punch with a mallet. Through the force of the strike both marks were created simultaneously. For this reason a bigorne mark will be found opposite the guarantee mark. The bigorne dies are so complex that two similar strikes could not be obtained. There are three types of bigorne used according the object size: large (16 bands), medium (13 bands) and small (21 bands). The rounded horn and the flat horn are used depending on the shape of the article to be marked. The borders separating the bands of insects are hollow except on the medium sized bigorne and on the rounded horn of the small bigorne. 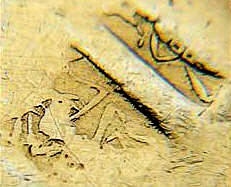 In these cases the tiny grooves are covered with dots; these serve as a support in the marking of very thin articles and also prevent the marks to appear only on the surfaces resting on the insects. The Article 185 of Appendix III of the French General Tax Code (which introduced the insect-engraved bigornes in use from 1838) was officially abrogated on 16 July 1984 by the Article 9 of Decree No. 84-623. resting on the insects.